You probably have heard. Google is restructuring. Sort of getting a new mother called Alphabet. The search giant will now be part of several companies under the holding company Alphabet Inc. Alphabet was formed as Google turns its focus on the future of technology and the connected world. Google has as a business acquired a lot of startups and other companies that are working on lots of different amazing things and some things that we never get to hear about. Like the project to beam the internet to those in remote areas using balloons. Or the ambitious plan to look into ways to prolong human life. Or the arm that invests in startups like Uber. Since the announcement, the internet has abuzz, firstly, trying to know just who is Sundar Pichai, the man to serve as the CEO of Alphabet. 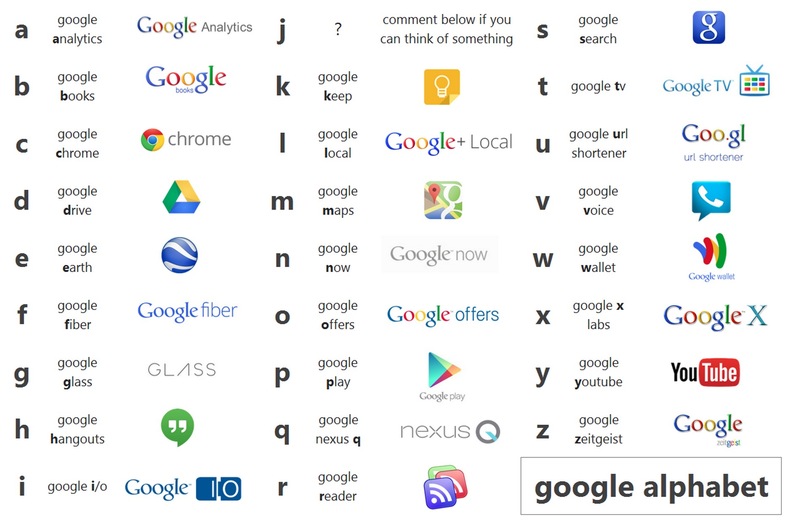 The internet has also unearthed a year old subreddit, where a question was asked “The New Age Alphabet: Google A to Google Z, can you think of something for the letter J? At that time, there was no Google Product with the letter J although right now there is Google Jump , which is their virtual reality video platform. One interesting aspect has been the ownership of online assets such as Twitter accounts and domains. Both the @Alphabet Twitter account as well as domains for the Alphabet brand are not owned by Google with Alphabet.com breaking shortly after the announcement of the news Monday but has not been back up since. The new company has instead opted to use abc.xyz. BMW, which owns a subsidiary called Alphabet has said it is looking into whether Google in any way infringed on its trademark by using Alphabet. BMW, operates the Alphabet brand in 18 countries supplying vehicles fleets to corporate customers. Commenting on the situation, Google said it does not plan to offer any services under the Alphabet brand meaning chances of a legal dispute are unlikely. According to a Reuters report there are 103 trademarks in the United States that include the word alphabet or a close variation. However, to prove this the holder needs to prove that Alphabet will create confusion between the two brands. BMW which owns the Alphabet.com website receives an average of 120,000 hits a month.